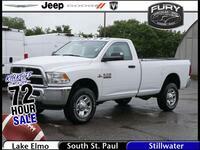 Truck owners in the St. Paul MN area may usually be satisfied with the capability of a light-duty full-size truck. However, when the going gets tough, a heavy duty model is the ideal way to optimize versatility and power. The 2017 Ram 2500 near White Bear Lake MN offers premium features, excellent power, and a number of comfort advantages that mean truck owners can get plenty of work done while also enjoying many of the little comforts of life. For the new model year, the 2017 Ram 2500 is also available with an elite off-roading option. The 2017 Ram 2500 4x4 Off-road Package offers Heavy Duty Ram owners the versatility to take that same power and performance beyond the pavement. Available on Crew Cab and Mega Cab body styles, this package will feature Hill-Descent Control, tow hooks, skid plates to protect the transfer case, Bilstein stocks, a limited-slip differential, premium tires, wheel flares, and Off Road decals. This is only one of the extremely capable options that will be available on the 2017 Ram 2500. There are many more high-value standard and available features. Many heavy-duty trucks can have a rough ride when not fully-loaded. However, the 2017 Ram 2500 features a five-link coil suspension that offers a premium smooth ride. With the optional air suspension system on this vehicle, truck owners will be able to get even more work done while maintaining premium comfort. The Cummins High-Output Turbo Diesel available on the 2017 Ram 2500 offers drivers a powerful premium engine with fuel efficiency that shames gasoline offerings. This engine can deliver up to 370 horsepower and 800 pound-feet of torque. It has a maximum tow rating of 17,980 pounds. While the first concern for any truck owner will be the capability of the vehicle, a comfortable interior can mean the difference between premium productivity and a miserable day on a worksite. The interior of the 2017 Ram 2500 can range anywhere from basic vinyl seating to leather upholstery and real wood trim. 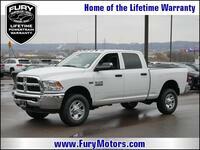 Truck owners looking for a premium and powerful vehicle have many options in the 2017 Ram 2500 near White Bear Lake MN. This heavy-duty truck is available in seven trims: Tradesman, SLT, Big Horn, Power Wagon, Laramie, Laramie Longhorn, and Limited. There are also three different engine options. 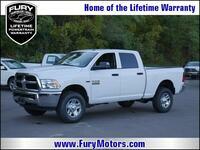 In addition to the available Cummins Turbo Diesel, Ram buyers can opt for one of two powerful gasoline engines. 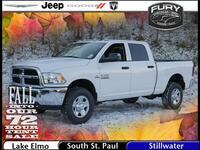 The base 5.7-liter HEMI V8 offers 383 horsepower and 400 pound-feet of torque. 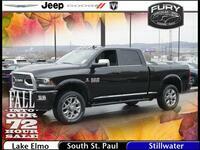 The advanced 6.4-liter HEMI V8 is rated for 410 horsepower and 429 pound-feet of torque. Both of these engines come standard with variable valve timing for greater efficiency. The 6.4-liter V8 also comes equipped with cylinder deactivation for even greater fuel savings. Other notable features of the 2017 Ram 2500 include the intuitive and high-value Uconnect infotainment system and the RamBox storage system. 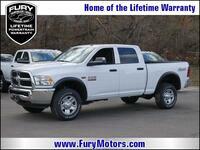 For more information on this vehicle, or to schedule your test drive today, fill out the form on this page or contact a member of the Fury Ram Truck Center sales team. 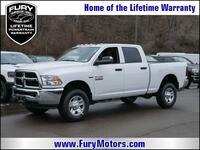 Interested in a 2017 Ram 2500?